Learn more about Laura: read our interview with The Jazzy Vegetarian! 1. Preheat the oven to 350 degrees F. Line a medium baking pan with unbleached parchment paper. 2. Put the bread crumbs, Italian seasoning, garlic powder, and salt in a large bowl. Put the walnuts in a blender, and pulse to process into coarse crumbs. Add the walnuts to the bread crumbs and stir gently to incorporate. 3. Put the mushrooms and onion in a blender, and process to a chunky purée. Add the mushroom mixture to the walnut–bread crumb mixture and stir to incorporate. Spoon out about 1½ tablespoons of the mushroom mixture and roll it into a ball. Continue in this way with the remaining mushroom mixture. Arrange the wheatballs on the lined baking pan. Bake for 25 to 30 minutes. Gently rotate each wheatball and bake for 12 to 16 minutes more, or until they are crisp and golden. 4. Bring a large pot of salted water to a boil. Add the spaghetti and cook, stirring occasionally, until tender but firm. Drain the spaghetti well. 5. Meanwhile, pour the marinara sauce in a medium sauce pan. Bring the sauce to a simmer over medium-low heat. Gently add the wheatballs to the sauce, one at a time, cover, and simmer for 7 to 10 minutes. 6. To serve, put one-quarter of the spaghetti into each of four pasta bowls, and top with three or four wheatballs. Ladle marinara sauce over the top and serve immediately. Chef’s Note: To make fresh bread crumbs, put 3 to 4 slices of wholegrain bread in a blender and process into coarse crumbs. Gluten-free option: You may use your favorite gluten-free pasta in this recipe. The wheatballs make a sensational base for a terrific hero-style sandwich too! 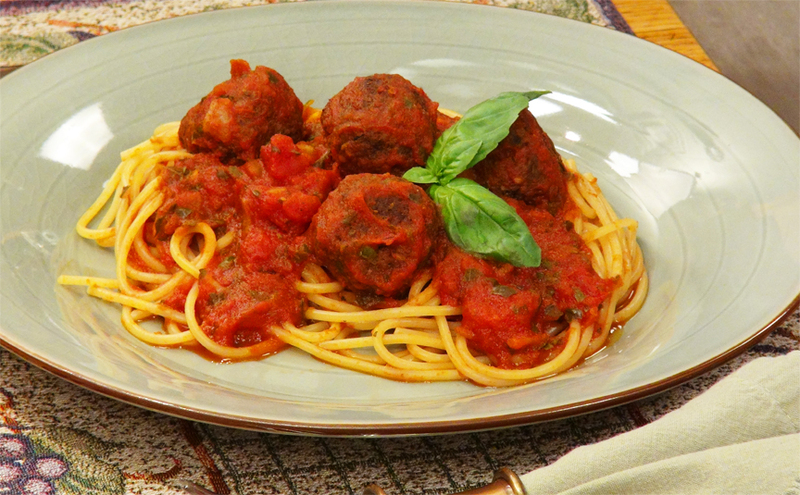 Let us know what you think of this easy vegan recipe: Spaghetti and Wheatballs!